Pagan pyros, scent ‘ho’s, perfume junkies, incense aficionados, candle-waxers and boline babes: come one, come all, to Holy Smoke! This book does it all, o flippers of the flames of Bic: lore, uses of smudges in ritual and prayer, for personal cleansings, meditations and trances, group ceremonies. It follows with explicit instructions and illustrations that show exactly how to do it, prepare it, get it, and burn it. Esoteric ideas about fire and smoke are discussed in the introduction. Well-organized topics are covered in two-chapter sets. First we learn about smoke baths and smudges, with recipes for seasonal smudges and personalized treats like “Feminine Focus,” “Masculine Manna,” and both lunar and solar-styled smudges. 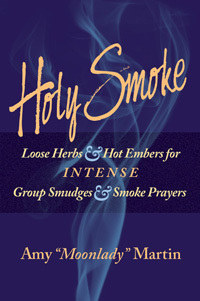 Chapters on smoke prayers and offerings, and smoke-based ceremonies follow. If you don’t know much about working with incense-making materials, the chapters on herbs are short but thorough, and include a very good glossary of herbs and other materials used in incense-making. I say this with extensive experience as an incense-maker myself: there’s not another book that offers such meaty and valuable instructions. The back of the book includes a list of vendors for ordering supplies and a convenient index. My only remark, not to be construed as a criticism, is that some peeps of the pocket-protector persuasion work with metric measurements, not avoirdupois. Sometimes sellers package materials in metric quantities as well. Conversion tables for metric would have been a happy bonus; however the author does provide equivalents for various dry ingredients. For the botanically-challenged, that means that she shows how an ounce of powdered petals takes up much less space in measuring cup than an ounce of shaved tree bark. You need to know that sort of thing, so it’s yet more necessary but rarely (if ever) included in other books on making loose incenses. Ye pimples of the pagan world, you are not worthy! The good Moonlady has managed to pack her pyro-lore into a very readable, useful small tome that is nonetheless packed with gold nuggets of wisdom for smoke-and-fire working. Recipes are formatted in easy-to-read, highlighted text boxes. The ingredient quantities are given in avoirdupois measurements (i.e., so many tbsp, cups, drops, etc.) and alternately in proportional parts for smaller or larger batches. With Yule on the way, this book is an excellent gift for the drude or drudette who holds the flame of your heart and the key to the herbarium, or for that ever-flicking coven mate with those amazing nose muscles. Get a coven copy – there are great projects from start to finish. Have a coven-crafting day and whip up a batch of Manifesting incense or some Spirit Food for your next sabbat. Take it easy on the wild lettuce and wormwood, but by the flaming fingertips of Prometheus, it’s all legal! So consecrate your cauldron, polish your thurible, clang the censer, spit in the fire pit, light a Lucifer and burn baby burn; what a way to say “hi” to the gods. If I had three thumbs, they’d all be up. Igor! Sew on another one! Scoot to your ether-flute and order copies of this book to keep and to share. Moonlady Media 2010, available at www.Moonlady.com .